There was an almighty thunderstorm here in Sri Lanka this morning, I'm not sure I've ever heard thunder claps like it. It was all very dramatic and cosy, wrapped up in our cotton sheets in the cabana while the rain came down outside. The skies have cleared and the sun is bursting through the clouds now. 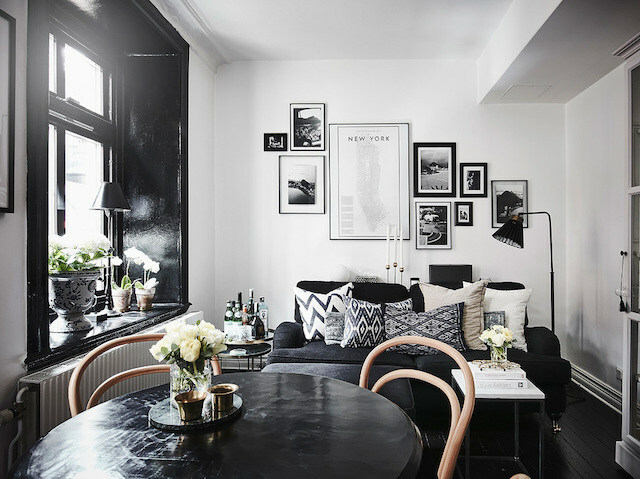 But in this Swedish apartment the beautiful dark expression remains. 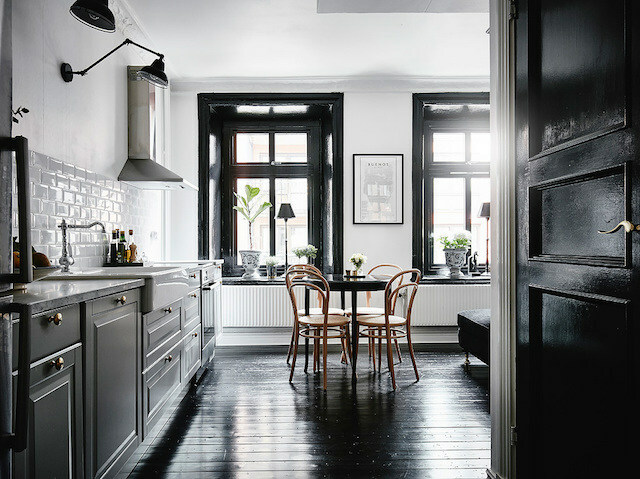 The use of black gloss on window frames, floors and doors still allows the light to bounce around the small space (it's a mere 39 metres square / 420 square foot). 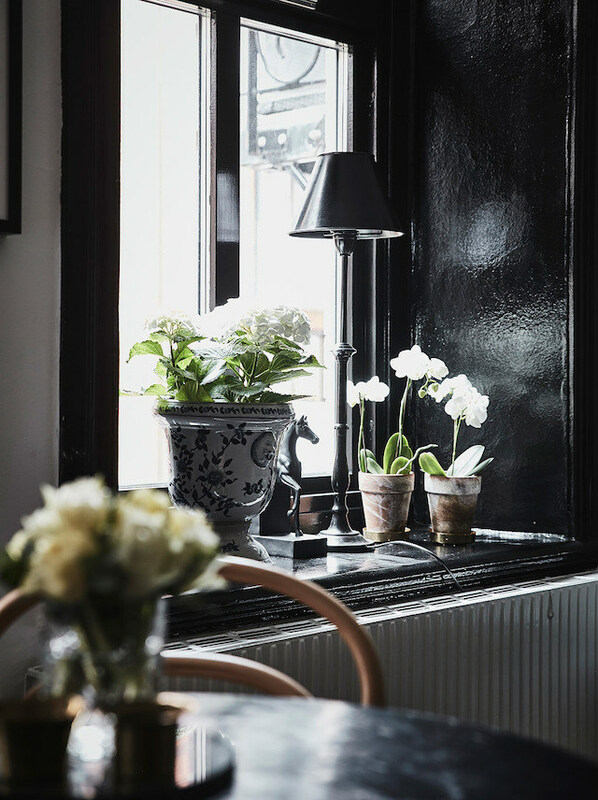 Add the perfect blend of classic and contemporary and the result is an elegant, yet cosy looking home. What a beautiful space! I love the tiles in the hallway too! 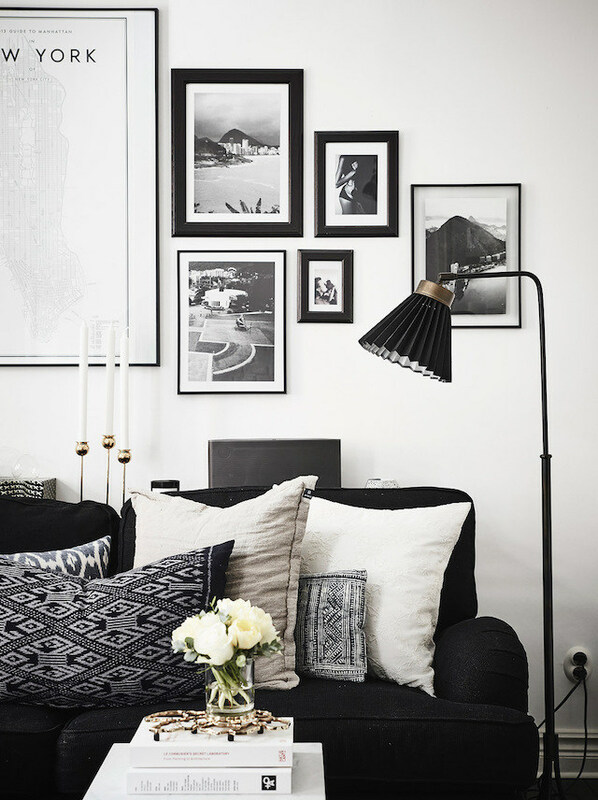 Items I know and love: New York 'manhatten' print, Source beautiful vintage Thonet chairs here, similar cushions include this one, this one and this one (cushions always look best grouped if you vary the size and shape so make sure you include an oblong shaped one in the mix). 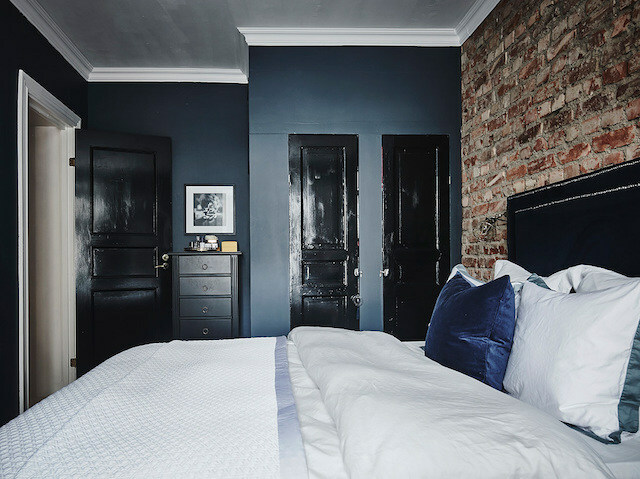 For similar paint colours try Farrow & Ball darks. You can see more of this home as well as a floor plan over at Entrance. 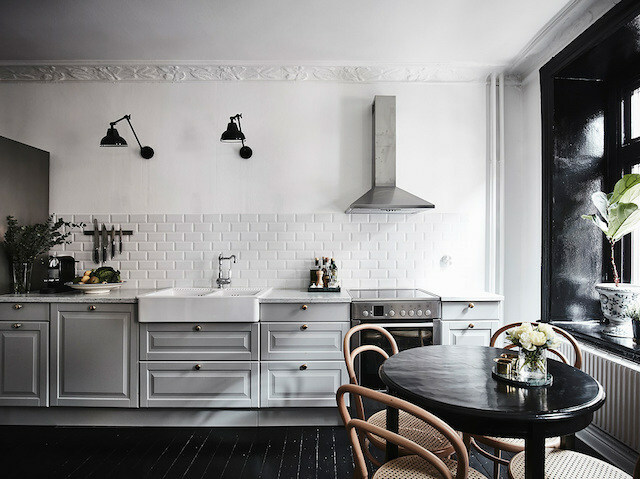 Other 'dramatic' homes with dark accents include this Stockholm pad, an elegant Swedish new build, and for something a little more boho - Krickelin's west coast home. That tile floor is my favorite part. What a lovely pattern! 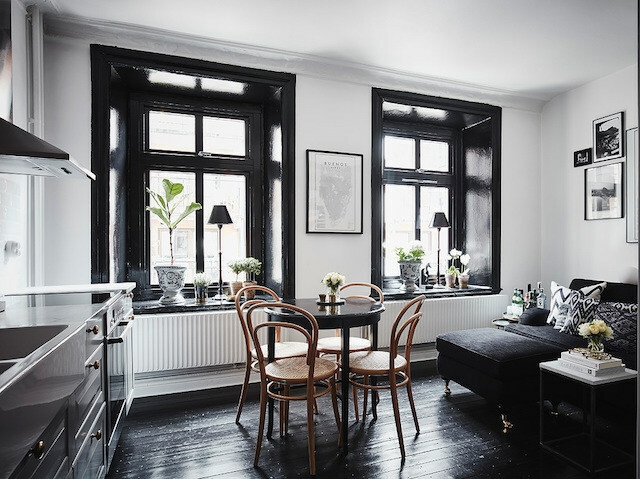 I would never think of using black as a main colour in my house, but this place looks so gorgeous I may be tempted to give it a try. 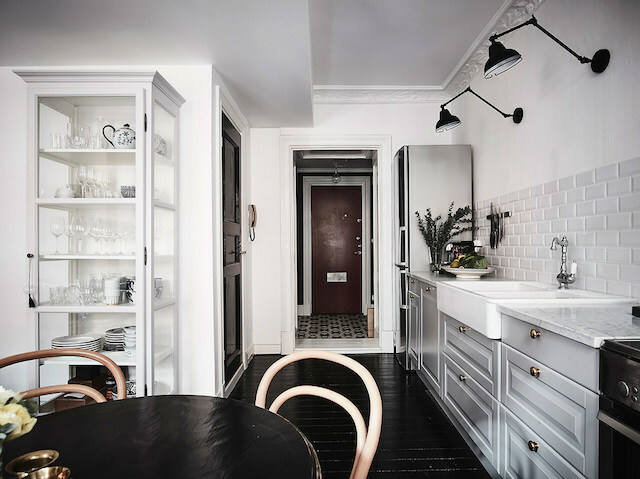 I love how the black gloss makes the light reflect around the rooms adding a unexpected warmth to each room. Wonderful! Lovely words and I've experienced the Sri Lanka tropical weather so can just imagine it. Oh and I love these floors too! Well that's a nice place to stay. Nice interiors!